Tap this page for Central Ammunition Depot CAD Sargodha Jobs 2018 Test & Interview Date. The well-known department named as Central Ammunition Depot which is having the affiliation with Pak Army is in probe of well disciplined, sharp-minded, and expert applicants are currently needed to fill out the following vacancies given below. 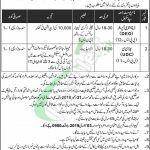 Jobs in Ammunition Depot CAD Sargodha are (Data Entry Operator (DEO) and UDC) are the posts which need to be filled by the applicants. As the posts are of minimum scales so the eligibility criteria are also simple as generally if we talk about this so Bachelors in Computer Science qualification (BSc) is needed with 10,000 Key Depression Per Hour is required and the applicants should be well versed in Computer Applications and for UDC Intermediate with Computer Course is required to apply. The quota is reserved for Sindh Region so eligible candidates from Sindh Province are invited to apply. Attractive salary package will be given to the applicants with growth offers also. So, after having these details let’s have a look at its applying criteria below. Interested applicants who fulfill all the demands need to apply by sending the application written on a plain paper with supported copies of educational and experience certificates, CNIC, domicile, and 2 fresh passport size photos should reach at the proper address. The last date for applying is December 31, 2018. The applications received after the due date and incomplete one will not be entertained. Written Test, Computer Test will be held on January 03, 2019. After recruitment, the applicants have to work at least for one year period and the applicants will be posted anywhere in Pakistan. The Govt employees should send their application through proper channel by issuing the NOC from their parent department. The number of posts can be canceled at any time by the Selection Committee. Last Date For Apply: December 31, 2018. Address: Assistant Commandant, CAD, Sargodha.